Such type of examples articles I found in Wahhabis/Salafis Sky Idols Worshiper’s Book and Speeches. This post I found on the time line of Maji- Umme Sara so let me share it here. Before anyone starts commenting negatively on this please understand that as lovers of Wali ALLAH- we are all ORDERED to love those Awliya ALLAH who are ordered to follow the path of the Sunnah…. So- please read this as an informative article and try & gather proof rather than mud-slinging…. whatever pleases them(or probably some super power). 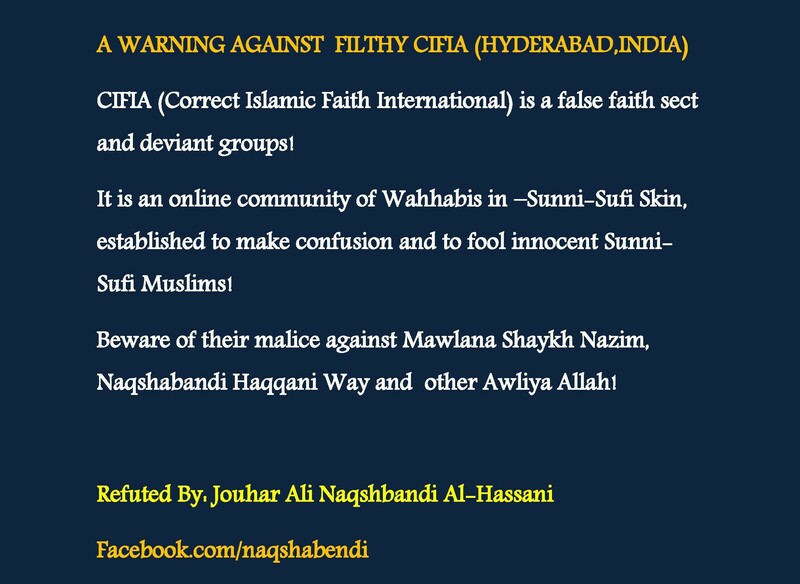 REFUTATION OF CIFIA’S ACCUSATIONS AND THEIR FALSE CLAIM TO BE SUNNI! Some irresponsible followers might have written something about Mawlana which he did not say! Islamic Shari’ah clearly states how to follow up when an accusation is made against a scholar/leader of Muslims or even an ordinary believer! Generally.Shari’ah says one must produce atleast 2 adult witness, and the one who is accused also should be asked about whether the accusation is true! This filthy CIFIA claims they are up on shari’ah of Islam!, if it is true why they not following this instructions of Shariathu Allah? Shari’ah only in mouth? not in actions? CIFIA team never visited Mawlana Shaykh Nazim Al-Haqqani! 1-Official site of Mawlana is Saltanat.org, they must bring proof from there or from books which is directly written by Mawlana! 2- If Shias wrote down something about Ali R.A which is not true about his life, then you don’t need to attack Ali R.A! Most Jahil (ignorant) CIFIA admins do not have (intellect) 5 paisa ka budhi! If shias wrote down something as Ali R.A said which contradict Ahlu Sunna Wa Jamah beliefs then you do not need to say Ali R.A is a blasphemer and false Imam (Naudubillah)!!!! 3- Shaykh Nazim Al-Haqqani is the Shaykh and Imam of this Tarikat in this times. So if you are truly followers of shari’ah you must go to Mawlana Shaykh Nazim (Q.S) and ask him for clarification, oh big shari’ah CIAFA! Because if 72 deviant sects misusing and misguiding people in Quran and hadith, you cannot put the blame on Allah or Prophet Muhammad (Alaihiswalathu wa salam) or even on Islam ! So if some so called followers inventing something into this Tarikat, then you must ask them! and not to say blindly Shaykh Nazim is corrupted or this Tarikat is corroupted! 4- When you take a word from whole talks of shaykh to interpret without taking back and forth, you don’t understand the meaning of what Shaykh said! if that is your munafiq way of understanding Quran, Hadith and religion, then you are from the category of 72 misguided sects! CIFIA Fools! 5-Shaykh Nazim (Q.S) never say my followers are better than Prophets or Sahaba! Mawlana always says, we can never be like Prophets or even in the rank and status of his companions (alaihiswalathu wa salam)! Imam Mahdi (A.S) replied: Ya Shaykh Ahmad, all Imams follow us, We are Mujtahidun Mutlaq (Absolute power of Ijthihad) like the Holy Prophet alaihiswalathu wa salam (Imam Mahdi is deputy of Allah)! So how can Shaykh Nazim (Q.S) say he and his followers are better than Prophets, Sahaba or 12 Imams? When the Prophet’s name (Peace and Blessings of Allah be up on him), Shaykh Nazim Al-Haqqani stands up to honour and respect Prophet even though Shaykh is very old and weak! Saltanat TV is the only official media of Mawlana Shaykh Nazim Al-Haqqani so take from there! Not from some so called Khalifas or Murids sites/blog! CIFA has childish brain in their heads? 6- Shaykh Nazim never said: the way leading to hell fire are accepted by Allah! Even if Shaykh said that one should take meaning from the attribute of Allah “Ar-Rahman” , Ar-Rahman provide for both believers and unbelievers, to atheists and even to Satan, the Mercy of Allah Ar-Rahman covered entire atom of creation!, including HIV Virus, Plague, Cancer cells all coming to exist by the Qudrath of Ar-Rahman! 7- Shaykh Nazim never said to look at the nakedness of the women! Looking of the ordinary man is forbidden as it is the looking of the ego to the ego! But Awliya Allah looks at the heart when they look at a believer!, their looking is Protected! Learn more about scanning and all before speak non-sense! Even if you wear full niqab, you cannot hide your reality from Awliya Allah, the are the guide, they can see any dirt you have! Once Shamsul Ulama Shaykh E.K Abu Bakar Musliar (Q.S), he was a great scholar, Shaykh, once his brother E.K Umar hadi (Q.S) a Wali of Allah left the Salah Jamath in the middle of prayer, lead by his brother E.K ABu Bakar Musliyar! Later he asked his brother Umar Haji (Q.S), why you left from the prayer during Jamath! he replied to his brother E.K Abu Bakar Musliyar (Q.S) : That is because you were in blood”! It was said by him that, while he recite a Quran verse about menstruation in prayer, he was thinking about the shari’ath (laws) of Menstrual period! So Abu Bakar Musliyar’s mind engaged in thinking about the laws of this matter and all that images which came in his heart was visible to his brother who stand behind and pray, so he left from jama’ath! What do you know about shari’ath wilayath oh foolish CIFIA ? 9- Shaykh says: whoever do not make Sajada to Allah will be destroyed and he even advising Pope to make Sajada to Allah! 10- Shaykh Nazim Al Haqqani teach us to fast according to Sunnah and Shari’ah! 11- Shaykh teach us to eat only halal food. Naqshbandi Ottomans do not normally eat even at restaurants due to the issue of doubtful provisions! only fresh ingredients brought from shops! Shaykh said: if you have doubt in the food, then recite Bismillah and kalima and blow on to the meat, so that Allah’s blessings and forgiveness may enter on the food you eat! Quran clearly says this: Islam allows to eat food of Ahlul Kitab (Kosher) as well as what is brought by a hunting Animal (normally dogs are used for hunting)! It is permitted in Shari’ah, learn shari’ah well before making mockery! Allah clearly says the forbidden food are those which are made a sacrifice for idols and false gods!, again says if someone eat from it out of compulsion there is no blame on him! It look like CIA (CIFIA) is the patent holders of Allah’s Shari’ath! 12-and the last accusations are basless! If CIFIA do not have brain to understand this hadith,they should as well known scholars! Shah Naqshbandi (Q.S) said: If anyone turn away from our way, you must fear Kufr (disbelief) in him! Allah says: 4:59 Quran: O you who have believed, obey Allah and obey the Messenger and those in authority among you. so understand and accept both quran and hadith, go and learn basics rather than making false shaitanic dawah! And Finally this refutation is not for the goodness of the CIFIA Satans! but for poor low thinking Muslims who can get caught by CIFIA, bilal philips and other 21st century jahiliya scholars and groups! I am here with my identity, I do not need to hide in a fake name and fake profile! Do they accept Shaykh Abdul Qadir Jilani (Q.S) , who said about Hazret Mansoor Hallaja, if I would have lived in the time of Hallaja I would have saved his life! Do CIFIA have courage to Make Fatwa against Shaykh Muhyiddin Abdul Qadir Al-Jilani (Q,S) for supporting Al-Hallaha? If they are one father’s sons, come up! Why Shari’ah accusation to some shaykhs and not to some other Shaykhs? Double faced and double standard munafiqs you, oh CIFIA (CIA)? a year ago they made a lot of fitnah and every year something happening to their head! Tell them to submit to Mawlana Shaykh Nazim and ask his forgiveness! truly they have attacked Sulthan of Saints! shamsul ulamakkum ..umar hajikkum idayil aano aa katha nadannath..allel gazzali shaikinum avare sahodaranum idayilano?..gazzali rahimahumullaaye bandhappeduthiyum prasthutha katha kelkkaarund..
assalamualaikum wa rahmatullah. believe me brother the guy from cifia is not a moral man. he claims to be from the tareeqat e qadria in hyderabad in the silsila of Hazrat Abdul Qadeer Siddiqui sahab…..but believe me i am also from the same tareeqat and nobody likes this man even there and he posts all sorts of lies regarding our silsila and himself. we never see him in mahafil of zikr…he is evil…..trying to break the unity among the ahle sunnat. please do not visit his website and if you read something regarding our tareeqat dont believe it. http://www.hasrat.com is the main website.